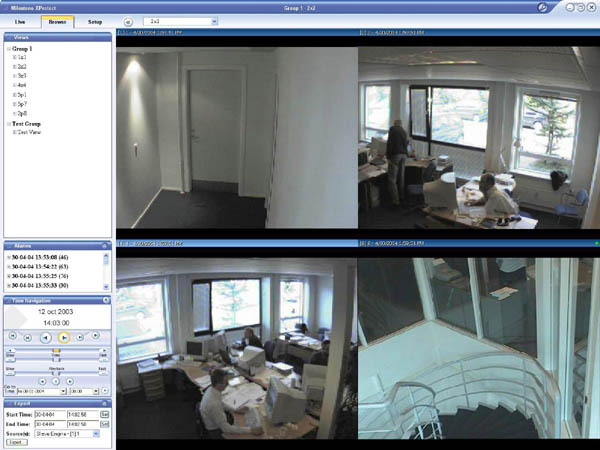 Milestone Xprotect Professional provides advanced features for installations up to 64 cameras. This Milestone solution provides core features for installations of up to 16 cameras. XProtect Professional is the advanced version of Milestone video surveillance software that is the perfect choice for installations of 1-64 cameras. It is a value-priced, high performance solution, well suited to the high-end SMB and entrepreneurial business market. XProtect Professional provides a state-of-the-art IP video surveillance system. The software supports the widest choice of network cameras and video servers, with the equipment connected directly to an office LAN or other TCP/IP network, such as the Internet. Digital recording is saved directly onto the hard drive(s) of the PC. For an excellent solution to advanced surveillance needs, XProtect Professional is the right product at the right price. [Find out more...] Milestone Xprotect Professional "Factsheet", 1,896kB pdf file. [Find out more...] Milestone Xprotect Professional "Administrators Manual", 2,640kB pdf file. [Find out more...] Milestone Xprotect Professional "Monitor & Viewer User's Manual", 589kB pdf file.